I read an opinion article by Gina Rinehart the other day. Gina, who is worth an estimated $19.89 billion, criticises welfare recipients for dragging the country into debt and says that ‘we are living beyond our means’. Treasurer Joe Hockey says the Age of Entitlement is over and it is time for all Australians to do their fair share of heavy lifting. That’s the kind of commentary currently making headlines. Painting welfare recipients as scroungers and scrivers, advocating for policy that ‘gets tough’ on welfare recipients. It’s also the kind of commentary that strikes fear into the hearts of people with disability and their families. Not because they’re bludging, not because they’re frightened of doing it tough. But because things are already so tough that people are not living, they are barely existing. And nobody seems to know, or care. Australia is ranked at the bottom – 29th of 29 OECD countries – for poverty amongst people with disability, even below countries like Mexico. 45% of us are living near or below the poverty line. In January 2012, the Government quietly brought in measures that would make 40% more people with disability ineligible for the Disability Support Pension. They changed the Impairment Tables, making it incredibly tough for anyone to go on a DSP – even if the cost of living is much higher for them because of their disability, even if they have no disability care and support funding. In employment, we’re not faring much better. One of the most telling and challenging statistics is that Australia ranks 21st out of 29 OECD countries in employment participation rates for people with a disability. And let’s not forget the rate of people with disability employed in the public sector – a measly 2.1 percent. 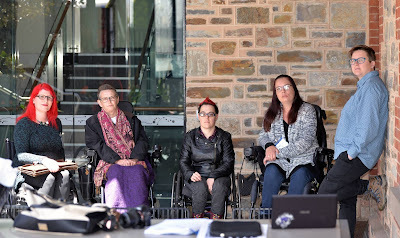 In May of this year, the Australian Human Rights Commission granted the government an exemption from the Disability Discrimination Act. That means that for the next twelve months, employees in sheltered workshops may legally be paid as little as a dollar an hour – even though the courts found the practice discriminatory and ordered it discontinued. Are people with disability doing it easy? Clearly, because there are planned measures being considered by Social Services Minister Kevin Andrews, who is overhauling the 15 billion-a-year disability support pension, the ‘most troublesome welfare entitlement’. Under those measures, disability pensioners will be re-examined by ‘independent medical experts’ at the Department of Human Services. There is also a rash of recommendations in the Commission of Audit report that would be disastrous for disabled people were they to be implemented. One is a plan to make job seekers move to high employment areas. 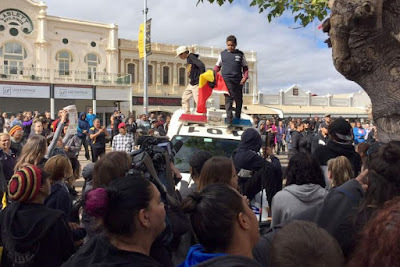 Consider the Aboriginal family who has a strong connection to their rural community – will their disabled son or daughter move away from country and family and their informal networks of support? Think about the guy who has no funding and whose ageing parents provide his care – now that he’s no longer eligible for a DSP, will his family move off the farm to the city in order for him to be ‘more likely’ to get a job? And what about the people who require a wheelchair accessible home, or those who simply cannot afford city rental prices because of the poverty and disadvantage they are entrenched within? There seems to be a lot of chatter about ‘the cuts we have to have’ and little about ‘what we’re going to do to support people with disability to get and keep work’. ‘Spreading the Budget pain’, with no recognition that what hurts a rich person’s wallet may actually cause the death of someone living below the poverty line. Not a word about investing in people rather than punishing them. And in the meantime, people with disability aren’t just doing it tough – they’re barely existing. The Age of Entitlement. Sorry, Gina. Your lofty perch doesn’t allow you to understand disadvantage. At a dollar an hour, it doesn’t matter how hard you work - you’re never, ever going to be Gina Rinehart. Image description - A cartoon by Crippen, with two men standing next to each other - one looks anxious. Walking away from them is the grim reaper with his trademark black, hooded gown and scythe. One man is saying to another: "I've just appointed him the new Chair of the Disability Benefits review team!"